There is something about water that attracts me like a magnet, so it should be no surprise to know that I am always looking for fabulous restaurants that are on the water or at least have great water views wherever I travel. During a short stay in Oslo in August 2005, Edward F. Nesta and I had dinner at the charming Lofoten Fiskerestaurant located at Aker Brugge. We sat a table by a wall of windows that had spectacular views of the Oslo fjord as well as the Akershus Castle. Although we had missed the actual season of the “Midnight Sun”, since we were there in early August, we were still able to benefit from the longer days of sunshine and enjoyed watching the boats on the fjord, as well as doing some people-watching, taking advantage of our window perspective. The restaurant has an excellent selection of fresh fish and shellfish on their large menu, as you would gather from their name, which translates into English as Lofoten Fish Restaurant. Their seafood menu varies according to the season, in order to provide the freshest of ingredients available. In addition to their seafood menu, they also offer vegetarian and meat dishes as well. Anders Svahnstrøm is the Chef de Cuisine. Please read Chefs' Recipes for Chef Anders Svahnstrøm’s recipes. 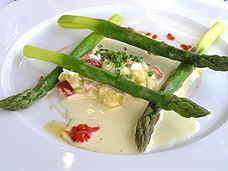 We began with an aperitif of champagne, which paired well with our starters of Asparagus with a Mango and Lobster Salad and A Lemon Thyme Beurre Blanc Sauce. The salad was visually appealing and offered a nice amount of succulent pieces of lobster, mango and tender large asparagus. For our main course, we selected a 2003 Macon La Roche Vineuse Vieilles Vignes Merlin from the Burgundy region in France, with 14.5% alcohol volume to pair with their Pimento Baked Halibut Served with Cabbage, Pommes Anna and Herb Gravy which consisted of champagne vinegar, olive oil, garlic, herbs and salt and pepper. 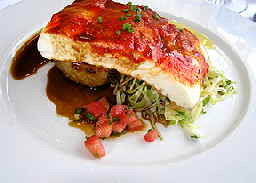 The generous portion of halibut was fork-tender and wore a coat of a delicious red pepper sauce, and was presented on a bed of shredded cabbage and Pommes Anna and was garnished with summer-ripe diced tomatoes. The 2003 Macon La Roche Vineuse Vieilles Vignes Merlin was very smooth, dry, medium-bodied and aromatic with white peaches and vanilla on the palate, with a hint of creaminess that complemented this outstanding fish course. For dessert, we selected a light summer dessert of fresh berry sorbet accompanied by sliced strawberries, diced fruit and a rich and creamy vanilla pannacotta with a caramel sauce drizzled on the plate. We paired our dessert with a 2001 Château Gravas Sauternes from Giroule, France that had a 13.5% alcohol volume, and was pale yellow in color, medium-bodied, and fruity with white peaches and dried fruit on the palate, that provided a nice finale to a most enjoyable meal. For other articles on Norway, please read our articles in the Destinations, and Chefs' Recipes sections. For more information on Norway, please visit: www.visitnorway.com, www.invanor.no and www.visitoslo.com. © October 2005. Luxury Experience. 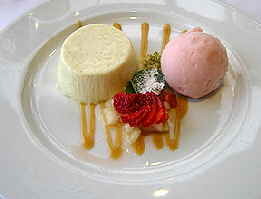 www.luxuryexperience.com All rights reserved.